The best companies’ organisation structures are around systems that encourage teams to be innovative, agile and collaborative. Hierarchy and red tape are often associated with autocratic, top-down organisation structures within a company. In the last few years, we see companies modelling themselves after flat or holocratic structures to appeal to prospective employees. But is hierarchy truly a bad thing or is it a necessary ‘evil’ in the 21st-century workplace? Research published at Stanford Graduate School of Business concluded that flat structures in companies create more functional teams. There is an assumption that companies with flat hierarchy thrive with their agile working style and are more cohesive with commonly shared beliefs and goals. Tesla, Nike, Github, SquareSpace, Google. These companies are linked to innovation and known for embracing and endorsing the flat company structure. As they expanded through business growth and maturity, they had to question their original culture. There is no one-size-fits-all management style. With that, how can you develop your company culture? Do you know what organisation structure you have or are working in? 2. Machine Bureaucracy (centralised decision-making, formalisation/standardisation in processes): Public administration e.g. government agencies, Singapore Airlines etc. 3. Professional Bureaucracy (decentralised bureaucracy, standardisation of skills): e.g. PwC, EY, Baker McKenzie, hospitals, schools and universities etc. 4. Divisionalised Form (diversified organisation, standardisation of outputs,): Microsoft, Vodafone, General Electric, General Motors, Samsung, Yum! Brands etc. 5. 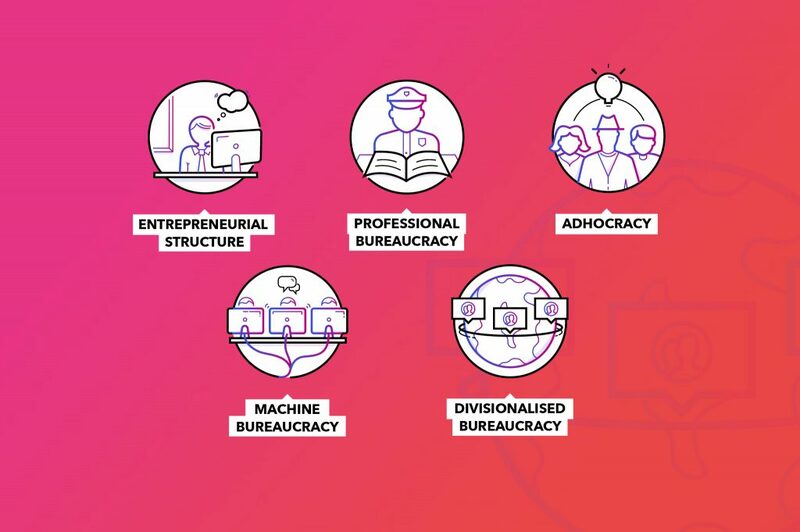 Adhocracy (organisation built on mutual adjustment, support staff): Advertising agencies, broadcast media, Film production houses, Facebook, Google, IDEO, Genentech, Netflix, Spotify etc. 6. Missionary Organisation (ideology-based) *: Toyota, Hubspot etc. *Note: Missionary and Political organisations were included later. – Nature of Work: Are operational processes standardised? Are roles clearly defined? – The Crux of Operation: Where is the key source of the organisation? Who moves the company? Is it your top management, operating core, middle management, technostructure (core operational unit), support staff? – Source of Decision-making Power: Is it centralised, decentralised or shared? Is hierarchy a bad thing? We will look into how you can nurture innovation within your company in the second part of this topic. To find out how you can build and transform your team or company today, speak to your local Cogs office. Part 2: Do flat, collaborative work structures truly drive innovation? Photo Credit: Mimi Thian on Unsplash.